"Bitter clowns tears with a hint of suspicion. Great with lobster Thermidor. Best drunk in the street. 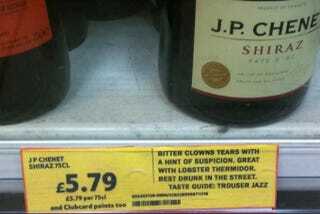 Taste guide: Trouser jazz." That's apparently what happens when a pair of performance artists wander around surreptitiously replacing boring, dry wine labels with infinitely more hilarious ones. The happening took place in a grocery store in London, England (where you can sell wine in grocery stores, and where society apparently hasn't collapsed, PENNSYLVANIA). We have also now answered the question "when will performance art stop being annoying and do something sublimely awesome," so really, it's a win-win all around. I'll be honest, I'm surprised anyone actually noticed. I mean, have you ever actually read the descriptions on wine bottles? They have all the pretension of Hollywood celebrity baby/lifestyle advice with none of the adorable, brain-damaged charm. Still, "clown tears" may have been an overreach — the human brain is so readily wired to experience terror at the mere mention of clowns that seeing that word will cut through the general background malaise of day-to-day life. A+ for effort and comedy, though.